Steve Lawrence and Eydie Gormé entranced the world from the 1950s through the 1970s as the superstars of the golden age of lounge entertainment. Induction into the Songwriters Hall of Fame capped an incredible partnership filled with Grammy and Emmy Awards, TV specials, Las Vegas headline appearances, a star on the Hollywood Walk of Fame, and millions of adoring fans worldwide. Now, in a sensational show filled with charming stories, witty banter, and powerhouse vocals, two sensational Florida-based singers recreate the chemistry and magic of the “King and Queen of the Nightclub World” in SIDE BY SIDE: A Steve and Eydie Tribute! 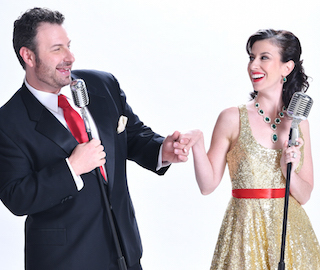 Audiences will enjoy highlights from Steve and Eydie’s 55-year collaboration as well as selections from their impressive solo careers in a funny, heartwarming, and toe-tapping journey through American popular song. From their memorable rendition of the original Tonight Show theme song (“This Could Be the Start of Something Big”) through Broadway favorites (“Cabaret”) to a moving tribute in honor of Eydie’s passing in 2013 (“The Way We Were”), SIDE BY SIDE is a refreshing and vibrant look at two of America’s favorite musical artists in an inspiring and joyful concert that captures audiences’ hearts. Sunday, March 24, 2019 • 3:00 P.M.